Werth Video Check-IP - Multi-Sensor Inspection System. This system is equipped with vision, touch probe and laser scanning capabilites. Keyence Manufacturing IM-6600 Image Dimensioning Measurement System - Fully automatic measurement system with Internal Pattern Analysis Search System. OGP Smartscope Flash 302 - Fully automatic dimensional measurement system. OGP Smartscope Flash 200 - Fully automatic dimensional measurement system. The quality of all of our manufactured and repaired parts is very important at SIS. We are constantly improving our techniques to enable us to produce higher quality products and services. In our facilities we have the latest computerized quality control measuring equipment for the inspection of completed and in process parts. In addition we utilize standard manual measuring systems throughout the manufacturing process to insure efficiently produced, quality parts. All production runs are QC inspected initially and then throughout the production process for key parameters, before final inspection is done on the completed parts. In 2001 SIS received its ISO 9001 Certification and continues to maintain that certification. SIS has invested in the latest state-of-the-art systems to enable us to inspect manufactured parts to customers' requirements. In addition to a wide variety of microscopes, gages, verniers, micrometers and other tools, we have several optical systems in our shops for the inspection of parts we manufacture and repair. The heart of our operations is a Werth Video Check IP System. This system uses optical, laser and touch probes to inspect parts and verify the dimensions of the finished components. Printed reports and statistical analysis of parts can be obtained with this system. We also have an OGP Smartscope measuring system. One of the instruments utilized at SIS for quality control inspection is the RAM Optical Measurement System. The system consists of a 20-250X video microscope with a computerized 3-axis digital microprocessor. This enables the accurate measurement of distance and diameter to within 0.00005 inch accuracy. Geometric calculations such as diameters, radius of curvature, angles, and deviations are easily computed with the digital microprocessor. Both metric and English measurements as well as instantaneous conversions between the two can be achieved. The system is used to measure holes, check alignment on filaments and perform other quality control measurements on finished products. Another useful tool is the RAM Video Inspection System. This system uses a video system that has a 1 inch depth of field at 20 times magnification. As a result it is an excellent tool to align filaments over the ion entrance hole in the mass spec source as well as to visually inspect filaments. After TIG welding the welds are tested to assure that they are leak tight. AT SIS we use an Alcatel ASM182T Leak detector to test all of our welds to assure that the welds will not leak even at very low vacuum levels. All vacuum fittings that are TIG welded and brazed in our shops are leak tested before they are returned to our customers. The helium leak tester which can detect leaks down to 2 x 10-11 atm.cc/sec. This leak detector utilizes a rugged turbo pump design for fast pump down and superior performance. If you have parts which you feel may be leaking, give us a call and we can test them for you. After parts have been machined, and then finished utilizing various techniques available in our shops including sandblasting and electropolishing, the surface finish must be verified. This can either be accomplished using the Surf-Test system shown below or the finish can be verified using our Werth optical testing system described above. 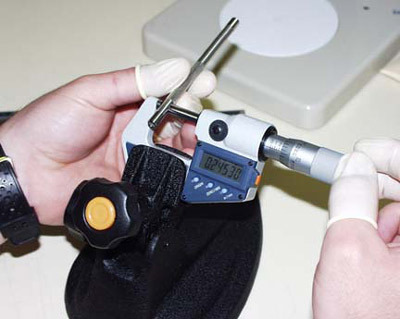 In addition to all of the high tech equipment shown above, we also have a wide range of verniers, micrometers and other measuring equipment to measure parts during and after manufacture.